Alaska has one of the most interesting wildernesses in the world. Click here to play! From polar bears to seals to killer whales, Alaska has distinctive wildlife. Possibly the only other place that can compete would be Australia. Yes, Alaska is certainly unique, and the Northern Lights slots show off the most interesting parts of Alaska in all their wonder. 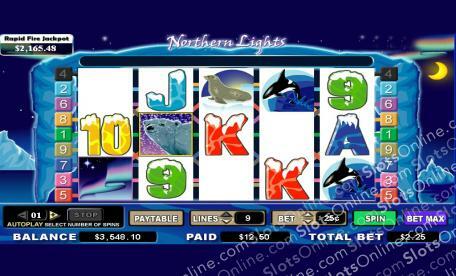 The Northern Lights game has 5-reels, 9 paylines, and it pays out a rapid fire jackpot at random, with larger wagers having a better chance of winning. Featuring symbols of classic polar imagery such as an Inuit hunter, the auroras that make up the Northern Lights, and the igloos that provide temporary protection from the elements, this is a game that will make you marvel at the beauty of the harshest environments on earth while also making you feel cooler in the summer. Strike out for the North Pole and see if you can win the jackpot prize of the Northern Lights slots. The Aurora symbol is the scatter, and it pays out on the total bet when 2 or more land on the reels. 3 or more scatters on the reels trigger the bonus game. The Polar Bear symbol is wild, and it can substitute for any symbol other than the scatter symbol. The bonus is triggered by 3 or more scatter symbols landing on the reels. In the bonus game, the player selects icebergs for the polar bear to jump on. Each successful leap awards a prize of up to 2,000 times the triggering bet. The game ends when the polar bear falls into the water.